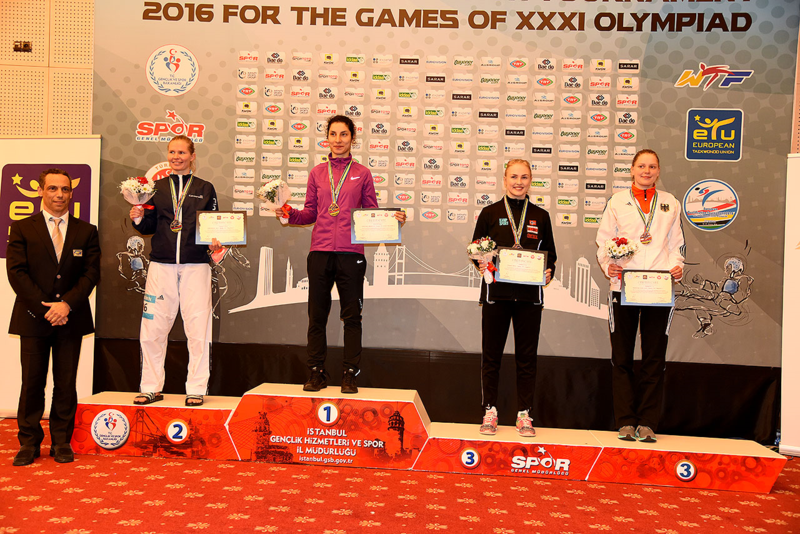 ISTANBUL, Turkey (January 18, 2016) – A refugee athlete was among 16 European taekwondo athletes from 12 countries who secured quota places for Rio 2016 at the European Qualification Tournament held in Istanbul, Turkey on January 16-17. 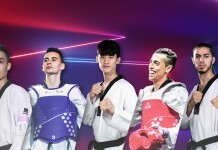 The European Qualification Tournament, held at Istanbul’s WOW Hotel and Convention Center, qualified the second tranche of taekwondo athletes to go to the Rio Olympic Games. A first tranche of elite athletes had won Rio berths through ranking; the Istanbul event is the first of the WTF’s continental qualification events. Refugee Raheleh Asemani, a former national team member of Iran, currently fighting out of Belgium, defeated Finland’s Suvi Mikkonen in the final of the female -57kg category to secure herself a place at the Olympic Games under the IOC flag. She thanked Laurence Rase, Performance Director of Belgium, Belgian Team Coach Karim Dighou and the WTF leadership for granting her the opportunity. “If this was a movie, nobody would believe it was possible!” added Rase, herself an Athens 2004 Olympian, while Dighou said he was “…living a dream.” Rase thanked WTF President Chungwon Choue for his letter of invitation for Asemani to attend the tournament. Asemani had competed under the WTF flag following the federation’s decision to allow refugee athletes to compete at the continental qualification tournaments for Rio 2016 Olympic Games. The WTF amended its rules at the end of last year in response to the IOC’s call to all International Federations to offer refugee athletes the chance to compete in Rio. Meanwhile, Azerbaijan obtained three Olympic qualification places (2 female, 1 male) at the European Qualification Tournament and Poland secured two (2 males), while 10 other countries won a single place at the Olympic Games. Serbia, Finland, Germany, Norway and the Netherlands each won a female place, while Israel, Spain, Croatia, Great Britain and Belarus each secured an Olympic berth in the male category. Great Britain and Azerbaijan now have a total of four berths at Rio 2016 alongside France and Mexico. Korea is the only country with five places at the Games. The European Qualification Tournament was operated a single elimination system. Each European member national association could qualify a total of four athletes, two male and two female, for the Olympic Games at the event. It was the first of five WTF continental qualification tournaments. The continental qualification events qualify the second tranche of taekwondo athletes for the Olympic Games. Forty-eight elite fighters have already won their NOCs quota places for Rio via ranking points accrued in previous tournaments. After the Turkish battle, the WTF’s remaining continental unions – Africa, Pan America, Oceania and Asia – will be holding their respective continental qualification tournaments in the first quarter of 2016. Each one offers 16 spots for the Rio Olympic Games, except for Oceania, which is allotted eight. In total, the continental qualification will decide 72 berths. The Olympic rankings already assigned 48 spots, Host Brazil gets four obligatory spots the International Olympic Committee (IOC), the National Olympic Committees (NOC) and the World Taekwondo Federation (WTF) will allocate four spaces as Tripartite Commission Places, which is better known as wild card.